"The utter antithesis between the modern world and the old is determined by all those things that formerly did not exist. Our lives have been enriched by elements the possibility of whose existence the ancients did not even suspect. Men have identified material contingencies, and revealed spiritual attitudes, whose repercussions are felt in a thousand ways." It would normally be unbecomingly immodest to describe one's own work as "keenly anticipated," but in the case of Changing Times, I have hard evidence; this PDF publication was selling well, with downloads in three figures, before its publication had even been formally announced. Of course, one might expect Transhuman Space fans to be forward-looking and Internet-aware . . . And I should also admit that this publication had been pre-announced and then unavoidably delayed in a rather teasing way. But these reactions were still flattering. Not that I can claim more than fragmentary credit here. 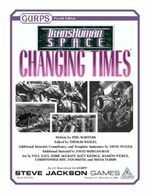 Changing Times is a guide and update for the Transhuman Space universe, which isn't my creation; all of us who've worked on the line must acknowledge the vast inspiration provided by David Pulver, whose setting this is. I was mostly adding footnotes. For that matter, as part of Changing Times is a set of rules-related updates to GURPS Fourth Edition, I inevitably drew on the manuscript versions of the new editions of GURPS Bio-Tech and Ultra-Tech, which were still under development at the time. It's not that technology in the Transhuman Space setting exactly matches the assumptions in those books in every particular -- when you're making guesses about the future, some variation is part of the fun -- but there were also points of close contact, and I tried to use the same game mechanics where possible. "The rapid progress true Science now makes, occasions my regretting sometimes that I was born too soon . . . Agriculture may diminish its labor and double its produce: all diseases may by sure means be prevented or cured, not excepting even that of old age, and our lives lengthened at pleasure . . . Oh that moral science were in as fair a way of improvement, that men would cease to be wolves to one another, and that human beings would at length learn what they now improperly call humanity." But anyway . . . These footnotes to David's masterwork did seem to be wanted, and I don't just mean the new rules stuff. The first half of Changing Times consists of a GM's guide, and the fact is, those of us involved with the line have kept hearing gamers say that they're impressed with Transhuman Space, but they feel lost and overwhelmed by the huge, detailed world of 2100, and can't see hooks for adventurous plots. Actually, there are plenty of such hooks, but they may need a little more finding than those seen in straightforward kill-the-monsters games. After all, in 2100, the question of what or who is a "monster" is wide open for debate -- and that debate can easily form part of a campaign. So I sat down and went over the setting looking for options, from the depths of Earth's oceans to the Kuiper Belt, and from deadly espionage games to weird sitcoms. A lot of this is categorization and cataloguing, but that's always a good first step. I hope that I'll get people not only playing more Transhuman Space games, but a greater diversity of such games. One concept which I openly borrowed from David is that of Mutable Point Totals, which Pyramid readers will recognise as having first appeared in his own Designer's Notes Article for the line's original core book, but which I felt deserved restatement and re-emphasis. It's actually an interesting option and approach for any campaign in any setting, but it has special resonance and usefulness in the wide-open worlds of Transhuman Space; it tells nervous GMs that, rather than worrying about the wilder possibilities of the setting, they should emphasize and embrace them. In Tanith's fourth adventure, she's on Luna, hanging around the Moonshadow spa waiting for her new hand to grow, while Grimalkin prowls the bars. However, the GM decides to make things interesting. In the spa, Tanith runs into a tall, dark, and handsome stranger who turns out to be an Amortality Assassin. Tanith discovers and foils the assassin's plot (one-handed! ), and the GM awards her 2 character points. He also tells her that a local reporter, who got a good story out of this incident, qualifies as a 3-point Contact. She also gets her hand replaced, eliminating the One Hand disadvantage. This interlude has thus seen a net gain of 20 points; she's now a 173- point character. In the party's fifth adventure, Tanith and Grimalkin go to L5 to salvage a nuclear reactor from an abandoned plague-struck space habitat. Unfortunately, it's not abandoned: they discover a nest of Maple Syndicate data pirates. In the ensuing firefight, Tanith is shot dead. Grimalkin rushes Tanith's corpse to hospital and arranges for it to be brainpeeled. The operation succeeds, and Tanith is now a ghost. Grimalkin can't afford a new body for Tanith, but she remembers the cyberdoll they captured, and has it repaired. Tanith wakes up in that. It's worth 127 points -- 40 more than her old Tennin body (which was worth 27 for the template plus 60 for +2 ST and +4 HT), while being a ghost is worth 86! She earned 1 character point during the adventure, while Grimalkin had to take out a loan to cover the cost of all that work, which leaves her with a Debt [-2], so she's now a 298-point character. But she's no longer human . . . But along with the GM's guide chapters, there is indeed the Fourth Edition update material, tying the wondrous technologies and concepts of the world of 2100 to the new rule mechanics. This, as it turned out, couldn't be "complete," in the sense that we didn't, for example, have room for all the templates from all the supplements (some of which are a bit specialized, if truth is told). I squeezed in everything from the original core book, plus some useful bits and pieces from elsewhere or from out of my own head; hopefully, that'll provide plentiful guidelines to any GM who wants to use anything out of the other books before anyone gets around to producing an appropriate official conversion. But by way of further illustration, let's look at a couple of templates from Jon Zeigler's excellent Fifth Wave. Transhuman Space has various categories of "racial" template to consider; parahumans/bioroids, uplifted animals, infomorphs, cybershells, and so on. The Fourth Edition version of Bio-Tech tackles a lot of relevant organics, providing direct conversions of some (though not all) Fifth Wave content, so we'll focus elsewhere. "There are three classes of intellects: one which comprehends by itself; another which appreciates what others comprehend; and a third which neither comprehends by itself nor by the showing of others." Infomorphs are generally the most limited of these categories in terms of options, and Changing Times actually covers almost all of this subject. However, Fifth Wave does have one more type: the Free Meme. This pretty closely resembles the standard NAI-4, so we can use the new templates for that as a basis for the free meme template, making changes to parallel the differences in the Third Edition versions; see the notes on the NAI templates in Changing Times for more details. (Incidentally, many free memes may have Clueless as well as No Sense of Humor.) However, there are three problems or points of variance worth mentioning. 1. As a bit of detail color, this version of the template is permitted to take Obsession or Extreme Fanaticism in place of standard Fanaticism, if desired; the exact form taken by a free meme's motivations can surely vary quite a bit. 2. The original template has the Parasite disadvantage, to represent its dependence on an existing AI system; unlike "regular" AIs, free memes can't function as standalone computer operating systems. However, Parasite no longer exists in Fourth Edition games. To represent this requirement, the template is given a Dependency. Having an AI or similar to manage the cybershell on which the free meme is running can be treated as "Very Common" (AI-run systems are that pervasive in 2100), and the free meme is clearly Constantly dependent. If the managing AI shuts down, the GM can simply apply the standard effects for such a missed Dependency -- 1 HP lost per minute, representing progressive system failures in the cybershell or something; alternatively, one can rule that, just as a machine which misses its fuel requirements just stops going until refuelled rather than suffering progressive damage, a cybershell without a governing AI simply shuts down until something appropriate is reinstalled and rebooted. 3. The original template also included Computer Hacking as a racial skill; however, that's now classed as cinematic, and won't be permitted in a lot of "realistic" Transhuman Space campaigns. Free memes have to be able to subvert and infiltrate computer systems, but can do this in a wide variety of ways. Hence, unusually for a "racial" template, this one is given a choice of skills on which to spend some of its points. At the GM's option, these points might also be assigned to appropriate Contacts, Perks to represents knowledge of crucial access codes or "back doors" into various system, and so on. Advantages: AI (without Reprogrammable) ; Enhanced Time Sense ; Indomitable ; Possession (Digital, -40%) ; Single-Minded ; Unaging (IQ only, -75%) ; Unfazeable . Disadvantages: Automaton (without Slave Mentality) [-45]; Dead Broke [-25]; Dependency (Presence of another, controlling AI on the same system; Very Common, Constantly) [-25]; Extreme Fanaticism, Fanaticism, or Obsession (long-term) (9) [-15]; Social Stigma (Subjugated) [-20]. Racial Skills: Computer Operation/TL10 (E) IQ+3 -11, and 12 points in any of Computer Operation/TL9, Computer Programming, Electronics Operation (Communications or Media), Fast-Talk, or improvements to Computer Operation/TL10 -- or Computer Hacking in cinematic games. Features: Complexity 4 program; Taboo Traits (Self-Awareness). Note: Some free memes may be Reprogrammable, having been designed to be brought back under control by their original creators if necessary, or being closely based on a standard NAI design -- but most people who choose to create free memes deliberately make them as hard to control as possible. Unlike properly designed AIs, free memes not only can have a wide range of mental disadvantages, but often do -- but they also occasionally have interesting advantages, such as the Full Memory Access enhancement on their Possession advantage. Some also "buy off" the Incurious disadvantage (included in Automaton); indeed, their interest in the world in general can be intense, if quirkish or erratic. A free meme's "Subjugated" Social Stigma is something of a variant case. On the one hand, nobody (except possibly its original creator) regards it as a servant or a slave, and it has rather more freedom of action than most subjugated entities; on the other hand, almost everyone regards it as a minor nuisance at best, a deadly menace at worst, and will probably delete it without a second thought; it can very easily find itself marked down for elimination. While there are relatively few really distinct infomorph categories, there is a huge assortment of cybershell types on which infomorphs can run. Fifth Wave's "wingbot" is a handy option for adventuring types, albeit mostly as a tool or remote-operated drone -- its computer is just about big enough to run some fully-sapient software, given use of expensive high-end options, but it's a bit flimsy and short of features for most PCs to want it as a primary shell. Most of the template's features convert straightforwardly, but it's worth going over a few of the details. 1. The Third Edition version has ST 4, which converts to ST 6 in Fourth Edition. The original also has 2 HP, which sounds a bit weak for a 45 lb., ST 6 machine, even one which is described as "physically delicate" and which is built for high-agility flight -- even the buzzbot, a flying cybershell which weighs just 5 lbs., is given 3 HP in both editions. So we'll allow ourselves a bit of flexibility in the conversion and grant the new treatment HP just one less than its ST. Other attributes convert straight over (and this thing's DX is highly respectable -- it's evidently very agile). 3. The wingbot is described in the text as using "batteries," but has Filter Lungs rather than Doesn't Breathe. The most plausible interpretation of this is that it uses some kind of fuel cell system, requiring oxygen from the atmosphere but generating electricity to power its various systems. The details of the template can be set accordingly. 4. It's also described as having just two hours' endurance when in flight, but can stretch that to 30 hours if it stays on the ground -- and it's far from useless in the latter case. It'd be nice to represent that feature, though it's a little fiddly. The best approach seems to be to give it Reduced Consumption 2 (which strictly speaking only gives 24 hours of operation; it's up to the GM whether to enforce this strictly or stretch it to 30 hours, but a higher level of Reduced Consumption would take the period out to a full week) -- and then give its Flight and Enhanced Move (Air) a Temporary Disadvantage limitation, with the "disadvantage" consisting of replacing Reduced Consumption with Increased Consumption 2, a net -24 point modification and hence a -24% limitation. Attribute Modifiers: ST-4 [-40]; DX+4 ; HT+2 . Secondary Characteristic Modifiers: HP -1 [-2]; SM -2. Advantages: Absolute Direction (Requires Signal, -20%) ; Acute Vision 3 ; Affliction 3 (Stunning; Armor Divisor (2), +50%; Melee Attack, Reach C, -30%) ; Damage Resistance 3 (Can't Wear Armor, -40%) ; Enhanced Move 2 (Air) (Temporary Disadvantage, replace Reduced Consumption 2 with Increased Consumption 2, -24%) ; Enhanced Move 1 (Ground) ; Filter Lungs ; Flight (Cannot Hover, -15%; Small Wings, -10%; Temporary Disadvantage, replace Reduced Consumption 2 with Increased Consumption 2, -24%) ; Machine ; Night Vision 9 ; Payload 5 ; Peripheral Vision ; Reduced Consumption 2 ; Telecommunication (Cable Jack; Video, +40%) ; Telecommunication (Laser Communication) ; Telecommunication (Radio; Video, +40%) ; Telescopic Vision 4 ; Temperature Tolerance 3 . Disadvantages: Cybershell Body [-15]; Maintenance (Electronics Repair and Mechanic skills, 2 people, Monthly) [-4]; Mute [-25]; No Sense of Smell/Taste [-5]; Restricted Diet (Common, hydrogen or refined hydrocarbon fuel) [-20]. Perks: Accessory (Drug Injector); Accessory (Small Computer) . Features: Individuals of the same model closely resemble each other. Copyright © 2006 by Steve Jackson Games. All rights reserved. Pyramid subscribers are permitted to read this article online, or download it and print out a single hardcopy for personal use. Copying this text to any other online system or BBS, or making more than one hardcopy, is strictly prohibited. So please don't. And if you encounter copies of this article elsewhere on the web, please report it to webmaster@sjgames.com.